My Boy Scout training failed me Wednesday in Rhode Island. 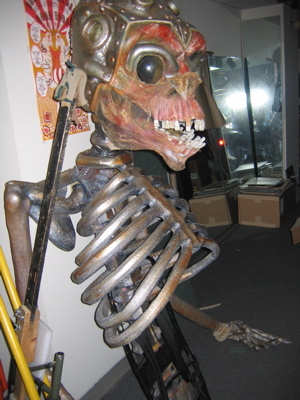 I took a day of my Boston/Cambridge trip to meet Erminio Pinque, mastermind behind the puppet creatures that are Big Nazo. I planned on picking his brain and absorbing the scenes of Big Nazo Lab. 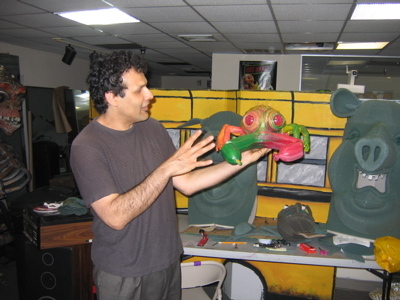 I wanted to document his techniques, see what his style was all about, and meet a professional East Coast puppeteer. I only had about 4 hours to do all of this and should’ve brought a voice-recording device along with my camera. I wasn’t prepared, and rushed off to catch my train back to Boston awash in thoughts, visuals, and emotions that soon faded into shadows of their original energies. I wasn’t prepared! Erminio Pinque shows two curious people a hybrid creature that Big Nazo created for a restaurant ad campaign. 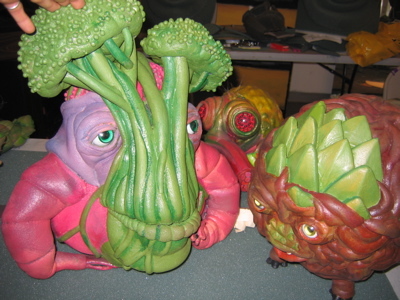 I think this is a brimp, a broccoli and shrimp creature. Most of the first hour with Erminio consisted of his catching up on bookings, calls, job requests, meetings, etc. He had just flown back from Los Angeles where he met with Wet Design executives. They design the entertaining water fountains that creatively shoot water about and are about to roll out new engineering magic that, according to the CAD mock-up that Erminio saw, create “water expression.” Basically, Wet Designs has figured out how to animate water into characters who have personalities and tell stories. The company wants Erminio to help them pitch the idea and he was excited about the whole concept of water coming to life. So he was a few days behind on booking shows and scheduling performers. As he took care of business, I walked around the Lab snapping photos of different styles of puppets. Between tasks, Erminio would explain a design or answer a question. 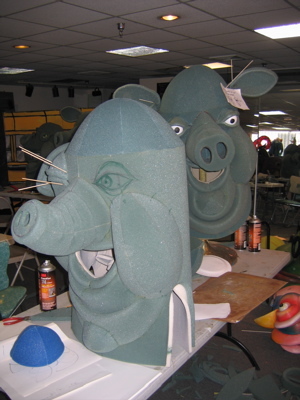 I got to see pig heads in design, giving me good clues about how he creates his “sculpture-costumes.” There was a foam backpack skeleton leaning on one wall, different 2-D paper puppets, and Big Nazo characters in piles around the room. Once he’d caught up a bit, we snuck out to grab lunch at a tacquaria near AS220, a community arts center. Along the way, we stopped at a few galleries and looked through the windows at the installations. Between calls and talking with people he knew, we talked about Burningman, puppeteers, the funeral business, and Greenville, SC (he’s performed there). He’s performed with Ben & Jerry, knew who Larry Reed was and was curious about how PuppetLOVE was going. Heading back to the Lab, still running into people he knew, Erminio took me to a local brew pub to show me some side-show-influenced banners that he’d made for them. We talked about circus and street art on the walk to the Lab. Back at the Lab, two people had wandered into the open doors to see the Big Nazo magic. Erminio obviously loved sharing his creativity, so he took a moment to show them around and answer questions. 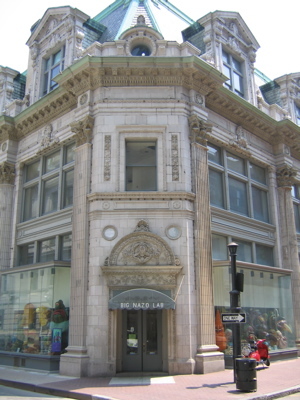 “People always walk in,” he said earlier that day. 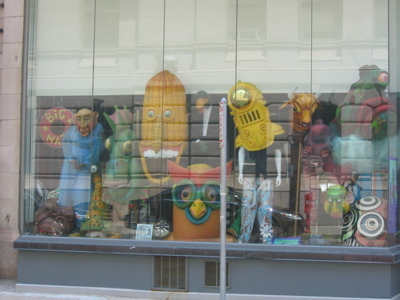 As he spoke with them, I met the Big Nazo intern and spoke with her as she worked on her own creature. Big business types were coming to the Lab, so Erminio asked the intern to clean up the floor. 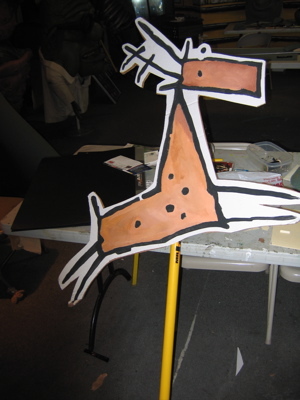 I helped out and then, once the meeting began, watched DVDs of the RISD “Creature Creations Winter Session” Course that he taught. 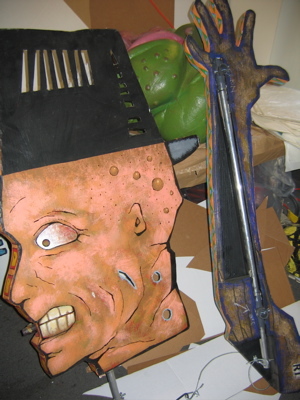 This 6-week session allows the students to learn to fabricate their own sculpture-costume. They first make a small foam thing, then give it eyes and movement. After that, they develop their creature via presentations to the other students. They then design and build their creature costume and finally take it to the streets for surreal fun. Finally they take a movement workshop and then perform their creatures on stage in front of a sit-down audience. This performance, from what I watched on the DVD, mixes video in as well as live improv music. Erminio shared two DVDs with me when he had a moment to spare. 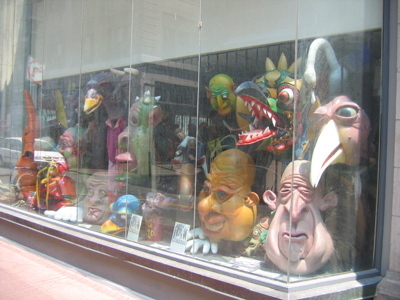 I got to see the many forms that go into the class’ process via slide shows of street performance, a video edit that showed how the class progresses and how one would make a Big Nazo-style puppet. Erminio would show me specific things and then comment on why he wanted to show it. Sadly, I don’t remember many of the details. Towards the end of my visit, Erminio finally had a moment to breathe, so we talked for about 30 minutes straight. Deep, well-thought ideas poured out. He spoke of the magic involved in being a creature in a mundane setting, the change of the story when the performer and the spectator connect to create a third entity. We discussed whether or not Big Nazo had a defined movement/puppet style and whether or not it worked in different environments. He commented on the subtle political message that subverting normality creates, and how people react to his creatures via that same channel. Erminio mentioned how he liked to mix different art styles, most recently putting Big Nazo masks on break dancers and having them audition at the Apollo in Harlem. 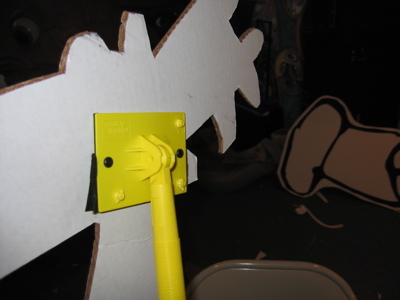 I shared my ideas about this, bringing up the Puppet Supper and CELLspace as examples of artistic culture mixers. He shared his amazement with the water expression concept and we discussed this in relation to puppetry. 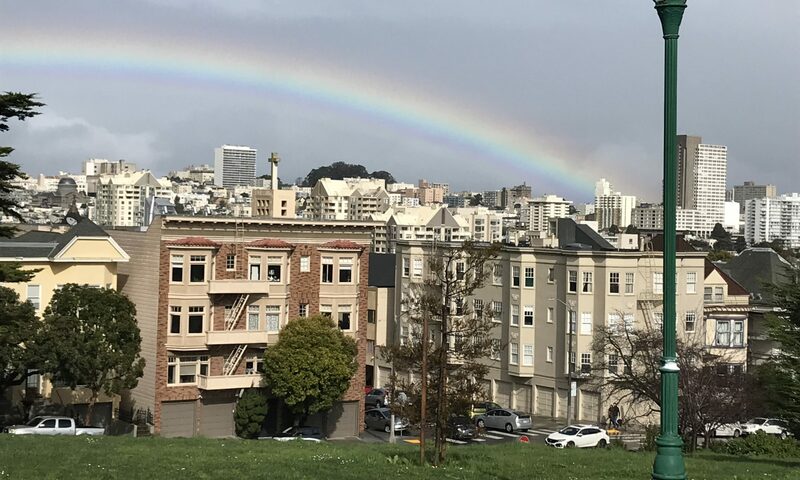 I kept having to break my focus on the talk to glance at the time, until, finally, Erminio and I literally talked out the door and to a nearby cab stand. Shaking and hugging, I told him I wanted to come back to play with the creatures. “When are you available?” he asked. “You saw how busy we’ll be,” he added. 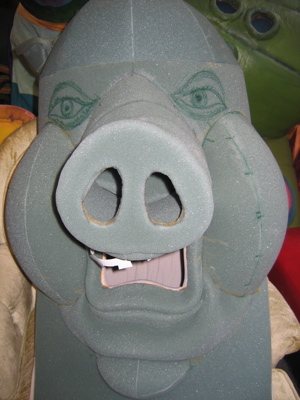 I’ll find out soon enough and hopefully make it down to Providence to hop into a Big Nazo creature, picking up a bit of Erminio’s language the best way I know how: via the framework of sudden improv puppet theater!